I have seen Van Morrison a total of 5 times (so far), and on most occasions have found myself coming away vaguely dissatisfied. But this instance not so, for VM was pretty special this evening. For this was his Ballads, Blues, Soul, Funk & Jazz Revue, which The Man took around the world in 1994. 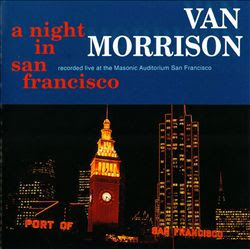 A couple of gigs from the tour were later recorded and released as the A Night in San Francisco double CD live album, which clocked in at a whopping two hours 25 minutes of music. I don’t think we were treated to quite that amount this evening, but it could not have been far short. I don’t really need to go too deeply into the set, as it reflected quite closely the SF live performance, particularly the salsa-lilted opener Did Ye Get Healed, and the lengthy soul medleys built around I’ll Take Care of You and See Me Through. Van’s daughter Shana was invited on stage to perform Beautiful Vision (which indeed she was) and You Don’t Know Me, whilst I also got my first exposure to Brian Kennedy with his rendition of You Make Me Feel So Free. All floppy hair, scarlet jacket and silly dancing he looked a bit of a prat, but he couldn’t half sing. Other highlights were a rollicking Help Me and a sumptuous In the Garden which morphed into Kennedy’s rendition of Sam Cooke’s You Send Me. Quite magical. Wouldn't it be great if it was like this all the time?